Usain Bolt is still the fastest man on the planet. The Jamaican won Sunday 's 100 meters of the London Olympics with a time of 9.63 seconds . It was the second fastest time in history, surpassed only by his own world record of 9.58, and also set a new Olympic record. Bolt cleared any doubts about his physical problems and, although it had a perfect start, 12/100 surpassed by his compatriot Yohan Blake, the world champion who recently defeated in qualifying for Jamaica. American Justin Gatlin took the bronze with 9.79 . Bolt turned in the second man in history that validates the crown of the showpiece athletics, after Carl Lewis won 1984 and 1988 . The sprinter also try to repeat his title in London, 200 meters and 4 × 100 relay.
" I did not get the best out of my life . My coach told me before the race not to worry because I am the best. 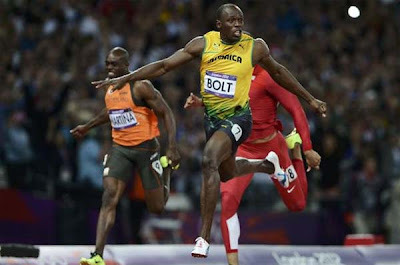 People can say what they want, when they get the big occasion, there I am , "said Bolt once the competition.